Doing beauty segments on Extra TV is fun and always a wonderful experience. The producers, Mario Lopez, Maria Menounos and the crew could not be nicer, they are always so welcoming. They ask me to talk about the latest and greatest in skincare, health and beauty. They’ve come to Malibu several times to film us demonstrating different facial treatments, Tai chi and Endermologie. When I go to the studio, I’ve noticed that people aren’t just interested in the great give-a-ways, but the audience really wants to learn about good skin care and what really works. It gives me great satisfaction to help them with their issues, as it does at the spa with our clients in Malibu. On my last visit to Extra I introduced and talked about my new Sea System; the Marine Comfort Cleanser, Clarifying Toner and V Peptide Eye Cream. I am excited to offer these high performance products that deliver extraordinary results, formulated with the newest technology in cosmeceutical skin care. The Marine Comfort Cleanser – Derived from beneficial Seaweed, Coconut Oil, and Wheat Germ Oil. This natural, nourishing cleanser lifts dirt, oil and impurities as it softens and rejuvenates the skin. The Clarifying Toner – Helps purify and refine the skin with a soothing blend of eleven herbs that tones the skin without drying it out. The V Peptide Eye Cream – Reduces under-eye puffiness and crow’s feet, while helping with dark circles. This combination of peptides and cucumber extract helps rejuvenate the eye area. Now we have The Sea System. 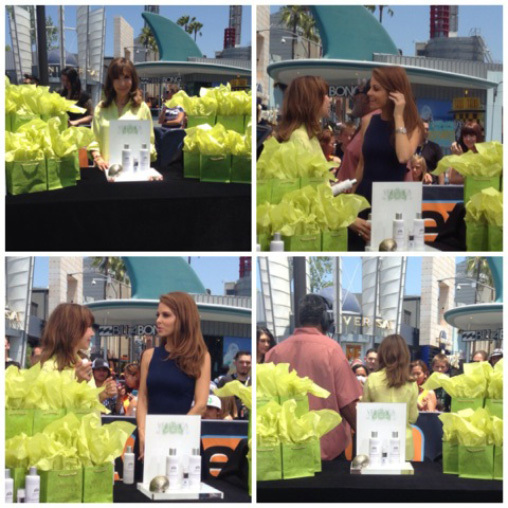 I’ll be on Extra TV July 4th, talking about my new products with Maria Menounos, and Extra’s Website will be giving away 5 sets of The Sea System Trio ($171 each). Hope you win and Happy 4th of July!